The Burleson Files | What We Don’t Know. During the American Civil War, morphine was widely used to treat pain, dysentery and malaria. Many farmers and citizens grew opium poppies to help support the war effort, rushing morphine to the front lines. Heroin also had a side effect of “opening up the body’s airways,” so Bayer started selling the drug to treat coughs and breathing disorders, in addition to morphine addiction. 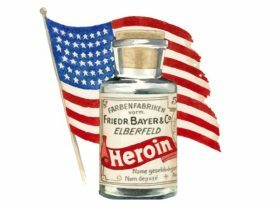 Americans could even order pure heroin from the Sears Roebuck catalog for $1.50 which included a syringe, needles and two vials of Bayer Heroin, packaged in a carrying case. Historical facts like these boggle the mind today. Today, over 70,000 Americans die each year from drug overdoses, up nearly 10% last year, to a record high. Combined with an increase in suicide by 3.7%, these two factors have lowered U.S. life expectancy for the second year in a row, according to the CDC. Why didn’t we understand the dangers of heroin and predict its powerful addictive properties? That’s the problem with making predictions. Often we’re wrong, but no one looks back at the people making the predictions and holds them accountable. Right now, there are a lot of people making predictions about the future of dentistry and orthodontics. I should know. I’m one of them. There are also a lot of people making investments in their vision of the future and taking strategic action to see those plans through to fruition. I’m in this boat as well. I’ve called for the elimination of dental and medical boards, much like the CATO institute. I predict a two-tier healthcare system. One will be run as a single-payer system, and in the words of a comedian I can’t remember, “delivered with the compassion of the IRS and the efficiency of the post office.” The other will be for the affluent who can afford to bypass this system. Think Mayo Clinic, Cleveland Clinic, Johns Hopkins and a loose network of concierge medical professionals. I admit things take much longer to change than we ever predict. If your kids or grandkids are still dealing with these issues, I wouldn’t be surprised. This doesn’t supersede your obligation to figure out how to position your practice appropriately, however. There’s nothing wrong with broadening your base, but not at the expense of your core values, strategic plan and objectives as a company. Marriott owns The Ritz Carlton and St. Regis but they also own the Courtyard and Residence Inn. They would be fools to operate these brands with the same strategy, pricing the Ritz at $129 per night or adding 5-Star Spa and celebrity-chef restaurants to the Courtyard or Residence Inn. Smart companies never stop asking where they might be wrong or what they might be missing. They look to the horizon without forgetting where they’ve been. They constantly seek to understand what they might not know. Just like Sears-Roebuck selling heroin for $1.50 at the turn of the 19th century, the orthodontic profession will face deadly consequences if we stop asking what we don’t know. For nearly a century, the orthodontic profession knew only two things: we provide a service that consumers desire and we are the only people who know how to do it. Fast forward to the present and ask how silly that sounds. Ask how no one saw Invisalign or Smile Direct coming and how that has transformed the consumer landscape. Ask yourself if you really think patients are going to drive to an orthodontic office when nearly all of them sit idle on Fridays, Saturdays and Sundays, consuming capital in a retail environment that has shown this to be unsustainable. Ask yourself how the democratization of healthcare and teledentistry will make orthodontists the stagecoach operators of the 20th century. Seek to understand how you can provide products and services that consumers will gladly pay more to obtain, driving past your competition, even avoiding the most-convenient way of receiving orthodontic care in the mail. Ask yourself what will be impossible or take a long time to automate with technology and AI and even when it arrives, how you will differentiate what you provide on a relationship level, so people still pay for your products and services. Someone much smarter than I said “The next financial crisis is never like the last one.” The previous housing bubble and financial collapse might look small in comparison to the coming tidal wave of automation and AI that has the potential to displace hundreds of millions of jobs by 2030, according to the McKinsey Global Institute. Where will that leave your patients and might they cut back on their own elective healthcare spending in the next downturn, whereas their children will still receive the care they deserve? The trend for adult orthodontic treatment and the way most practitioners treat adults is frightening. These majority of these consumers will not be visiting an orthodontist to receive orthodontic treatment in the future. The profession will catch up with me, as I eliminated adults from my practice in 2017. The trends on pediatric dental volume, however, and the long-road to automate treating young kids in a dental setting, combined with higher dental IQ in suburban and affluent urban settings made it clear to me that pediatric dentistry is a castle on a hill, surrounded by a moat, for now. I might be wrong about my predictions, but I’m willing to make them and invest in them. I sleep with one eye open and constantly ask where I might be wrong. I’ll never be done asking what I don’t know. You might consider the same approach. This is the path forward.